Women's work is worth more than cents on the dollar! Do you agree? Then join us in taking action! We're urging the Washington State Legislature to pass HB 1696 and SB 5090 which would ban employers from asking about pay history. 13 states and 10 cities have passed pay history prohibitions. Washington should be next! Legislators need to hear from YOU that this MOMumental equal pay legislation is a top priority for you and your family! 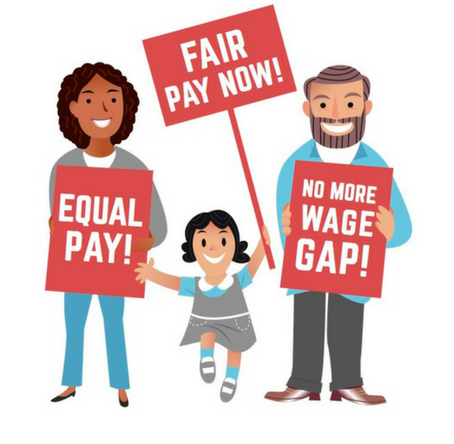 As your constituent and a member of MomsRising, I am writing to urge you to support important legislation that will help close the wage gap in Washington State: HB 1696 and SB 5090 which will prohibit employers from asking about pay history and make pay ranges more transparent. Last year, the Washington State Legislature made important progress on equal pay by passing the Equal Pay Opportunity Act, the first update to our state's equal pay laws since World War II. But the wage gap is an issue entrenched in centuries of discrimination. No law, taken alone, will lead to equal pay for equal work. Building on the progress made in the EPOA, I urge you to support HB 1696 and SB 5090. According to the National Women's Law Center, "employers who rely on salary history to select job applicants and to set new hires’ pay will tend to perpetuate gender- and race-based disparities in their workforce." And these disparities add up. The gender wage gap costs Washington $18 billion every year. Even when controlling for job type, education, hours worked, etc. economists consistently find that the gap cannot be explained away by anything other than discrimination. That is why 13 states and 10 cities have passed pay history prohibitions, an important tool in combatting discrimination in pay. Washington should be next. I urge you to support HB 1696 and SB 5090 this legislative session.